University Press of Kentucky, 9780813176406, 246pp. For over fifty years, Wendell Berry has argued that our most pressing ecological and cultural need is a renewed formal intelligence -- a mode of thinking and acting that fosters the health of the earth and its beings. Yet the present industrial economy prioritizes a technical, self-centered way of relating to the world that often demands and rewards busyness over thoughtful observation, independence over relationships, and replacing over repairing. Such a system is both unsustainable and results in destructive, far-reaching consequences for our society and land. 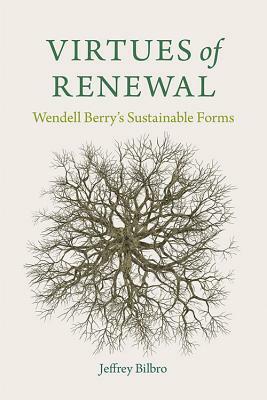 In Virtues of Renewal: Wendell Berry's Sustainable Forms, Jeffrey Bilbro combines textual analysis and cultural criticism to explain how Berry's literary forms encourage readers to practice virtues of renewal. While the written word alone cannot enact change, Bilbro asserts that Berry's poetry, essays, and fiction can inspire people to, as Berry writes, "practice resurrection." Bilbro examines the distinct, yet symbiotic, features of these three genres, demonstrating the importance of the humanities in supporting tenable economies. He uses Berry's pieces to suggest the need for more robust language for discussing conservation, ecology, and the natural -- and regenerative -- process of death. Bilbro additionally translates Berry's literature to a wider audience, putting him in conversation with philosophers and theologians such as Ivan Illich, Willie Jennings, Charles Taylor, and Augustine. Jeffrey Bilbro is associate professor of English at Spring Arbor University in southern Michigan. His previous works include Loving God's Wildness: The Christian Roots of Ecological Ethics in American Literature, Wendell Berry and Higher Education: Cultivating Virtues of Place, and Telling the Stories Right: Wendell Berry's Imagination of Port William.